You can view all upcoming meetings and appointments for the next week by clicking Meetings on the left side of the app. You can switch the meetings list between the current day and the upcoming week. It shows you everything that was scheduled in Teams, Exchange, or Outlook. See and chat with the participants. Respond to the meeting invitation. Cancel the meeting if you're the organizer. 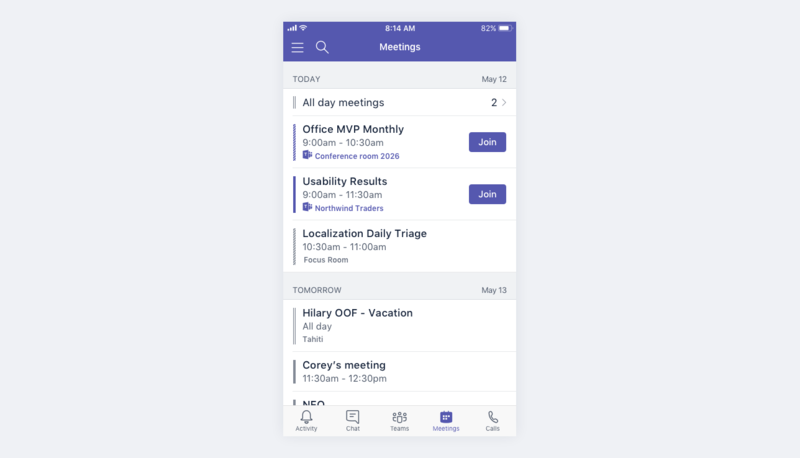 Tap Meetings to see the weekly calendar for all your meetings that have been scheduled from Teams, Outlook, or Exchange. Microsoft Teams meetings have a Teams icon and a Join button.